Who are you, where are you from, and what do you do? My name is Rich DiGiovanni I live in Ashby, Massachusetts. I carve skulls into as many different materials as I can. I was laid-off and at home shopping on eBay for carved skulls, after buying 4 different stone carved skulls I quickly realized I’m no position to be buying anything more than I truly need… so I looked out my window at a pile of pine logs, from the years previous logging of my property, caught my eye. I thought… I have a chainsaw and the desire to try to carve one for myself to save me from purchasing another one. A couple days later a friend stopped by and noticed a partially carved skull in the front yard, he asked what I was doing and how much I wanted for it. I quickly answered this is for me and not for sale, after about an hour of him not letting up I agreed to sell him the piece. He came back a couple days later to pick it up, it was a big one and weighed over 200 pounds. We put it in the back of his pick-up truck, strapped it down and a little over an hour later he called me and couldn’t say enough how I should never stop doing this, that I found my calling. He also said the 50-mile highway journey back to his home was surely responsible for multiple car accidents from people trying to get behind him and snap pictures with their cell phones at the same time. With this advice, I started my “Skulls 4 All Mortal Carvings” Facebook page and began to join as many skull related facebook pages as I could find and aggressively networking among page owners and artists. To me, art is creating something for mere visual pleasure with no practical purpose. It usually comes fluidly and almost uncontrollably. I feel compelled to create. I usually wake up between 3:30-4:00am every day. After a quick hot shower, I mosey down to the kitchen where a hot pot of coffee is waiting. I pour a giant cup, roll a joint and head downstairs into my shop, where I feed my inspiration with about an hour of social media promoting and surfing. Then I grab one of my current projects (I like to have at least 4 projects going at any given time) and begin the carving process for the day. Throughout the day I switch pieces if I become frustrated or stale, this usually keeps progress moving at a decent rate. How have others reacted to your work? Honestly its been a mixed bag. I’ve heard everything from “it’s so creepy” to “that is the coolest thing I ever saw” to “what do you do with it?” Some people are just plain terrified of my chosen subject matter, they won’t even come close enough to look at it. While others are so excited to look at every little detail… I take it all with a grain of salt. Do you do custom orders or specific request? Very rarely do I accept specific requests. The few I have done in the past have been very stressful and felt forced. I find it more rewarding to unveil the skull within the media rather than to commit to a specific plan… honestly, I have no idea what any of my pieces are going to look like until they are finished. Everything from a multi-tool, chainsaw, and die-grinder on some of the bigger ones, to a rotary tool with a multitude of different types of bits and knives for the smaller ones. Of course, there is also chisels, files, and sandpaper. It varies from all types of woods, local and exotic to antler, bone, stone, shell and all types metals. 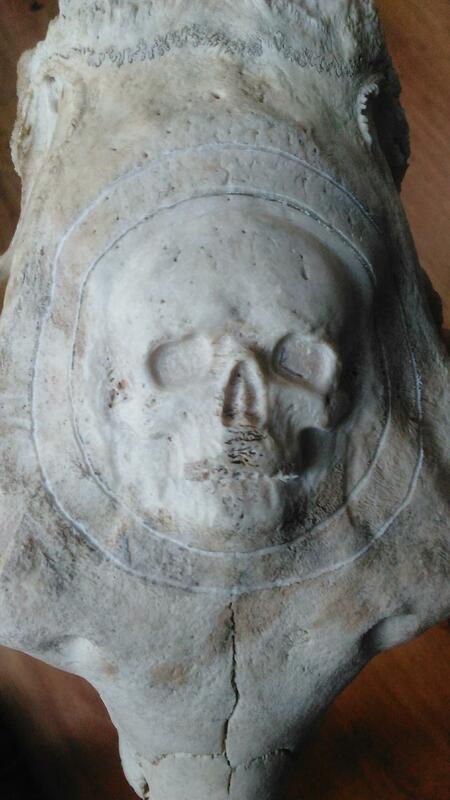 I currently have a human tooth to carve into a skull… I have yet to say no to a material. Name one of your most memorable experiences you’ve had being an artist. During my second year of carving while set up at the Hollis NH Flea Market to sell some of my carved skulls, I was approached by a gentlemen who introduced himself as a TV producer for a local TV Show called “Spektral Evidence”, he asked a bunch of questions about what I do while he was looking at my carvings, then he looked up and asked me if I would be interested in doing an hour-long interview on his show. I couldn’t say yes fast enough. The interview can be found on YouTube. What, if anything, would you tell your younger self? Don’t physically destroy your body to make a dollar. Capitalize on your creativity. There is a market for everything, find what you love then locate an outlet for it. Rich can also be found on Facebook (@Skulls4All) as well as Etsy (same handle). You can find our art blog, Jung Katz on Facebook as well as other social media channels too.